What princess does not dream to become the mistress of a small kingdom called a private bathroom with all necessary attributes? The answer is clear: Everyone! And today, our modifications will be dedicated to the transformation of Children. To be precise, it is room for girls. 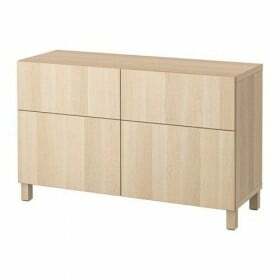 We represent your attention a large and capacious wall which with the help of individual pieces of furniture from IKEA collections, successfully combines the functions of cabinets and shelves. adhesive film, door handles, hinges. To begin the process of alteration, decide to start, you want to get a result. Depending on this, build a chain of successive actions and choices will depend on the size of the basis for the transformation - EXPEDIT shelving. 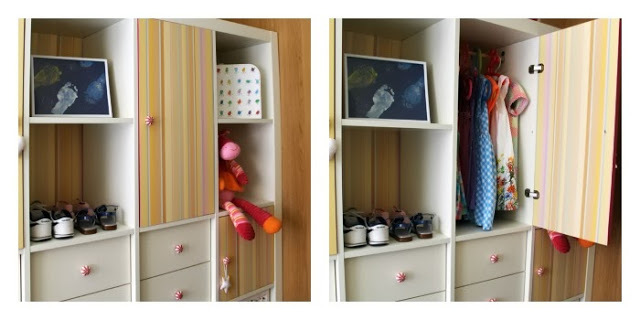 In our case, the wall must accommodate a maximum of things, so it is made of two even smaller cabinet and taken out of the largest rack EXPEDIT collection. 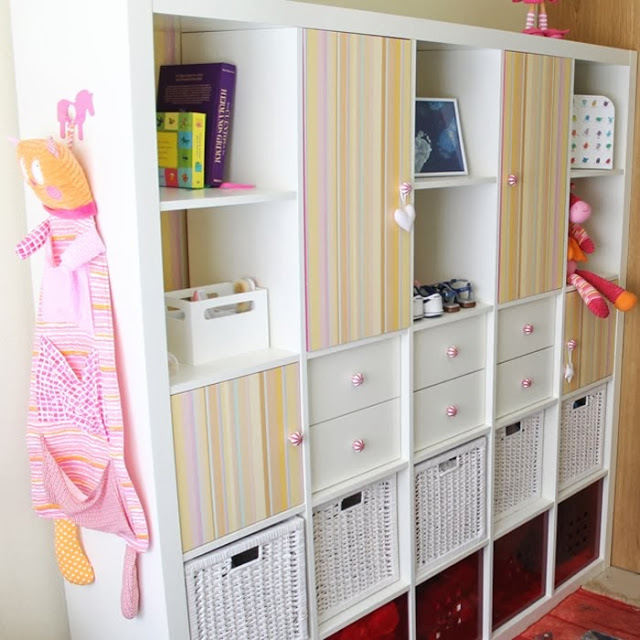 To do this, just need to remove a couple of pieces of horizontal boards to make shelves in cabinets where you can hang baby clothes. Stockpiled in advance of the board is made of the door to our lockers. 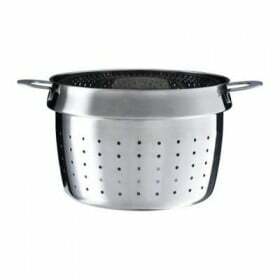 In this case, it does not matter its appearance, as it will be covered with adhesive tape, picked up in unison design the entire room. Within each of the lockers place clothes rail. Next, cut the board, which will be sutured back wall shelving, also cover the adhesive film. Midline EKSPEDITA we complete inserts from the eponymous series. Placed on the sides of the insert with doorsAnd in the middle - with drawers. The two lower lines are allocated to the Baskets и containers, Which are suitable for storage of various items. B IKEA catalog and they both come in several colors, allowing them to build the film on the door and the whole design space, where it will be our wall. If desired, decorate individual film surface. 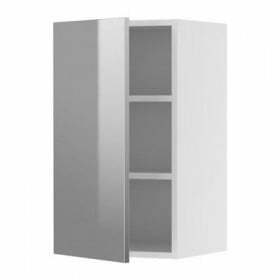 For complete harmony remains the same tie handles all EXPEDIT insert and cabinet doors. 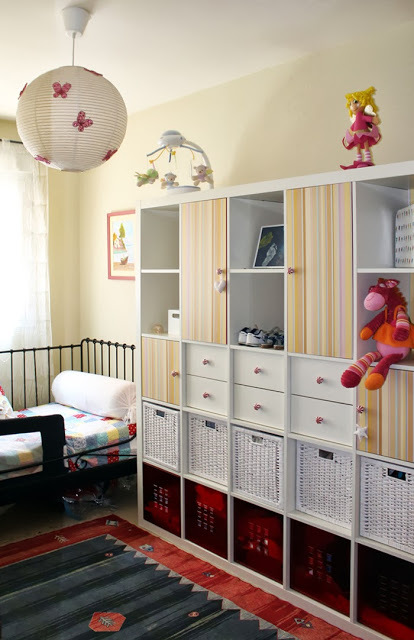 As a result, a small alteration, addition of elements of decoration and layout with other items from IKEA Catalogue we got a spacious and functional rack-rackWhich will place a whole "world" of your child: books, toys, clothes and even shoes. 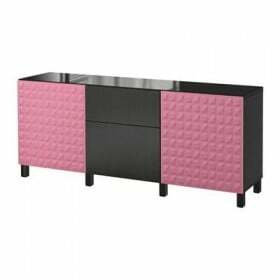 This piece of furniture is a real boon for small spaces.